Antique c1870s quilt measuring 82 inches by 84 inches. Pattern is a 9 Patch. There are 121 blocks (arranged 11 across by 11 down), set on point, measuring about 4.5 inches by 4.5 inches. The alternating squares and setting triangles is an over dyed green. There is no sashing, and 2 borders: 3" brown print, and a 4" green print. It is pieced by hand and by machine, and hand quilted in a grid in the blocks and brown border, and chevrons in the alternating pieces and green border. The backing is a pieced Bars Back or Strippy Back in 3 different fabric in browns. The binding is 3/8" wide, applied. 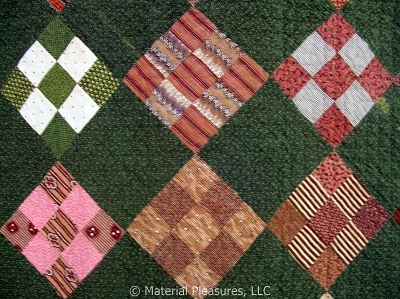 There are many early c1870s fabrics, including centennial green stripes, cheddar, chrome, butterscotch, double pinks, dark indigos, and a variety of browns. Condition is good. There is some dye loss in the green fabric and also an area of wear in the brown border fabric. Please Click on the Image Gallery to see additional photos.